Dr. D'Alessio accepts the following list of insurance providers. Select your insurance provider to see more details. I am a board-certified radiologist specializing in breast imaging and cross-sectional body imaging (CT). After completing my residency in diagnostic radiology at NewYork-Presbyterian Hospital/Weill Cornell Medical Center and fellowship training in breast and body imaging at Stanford University, I joined Memorial Sloan Kettering’s Department of Radiology in 2005. As a member of the Memorial Sloan Kettering faculty, I am involved in clinical care, education, and research. 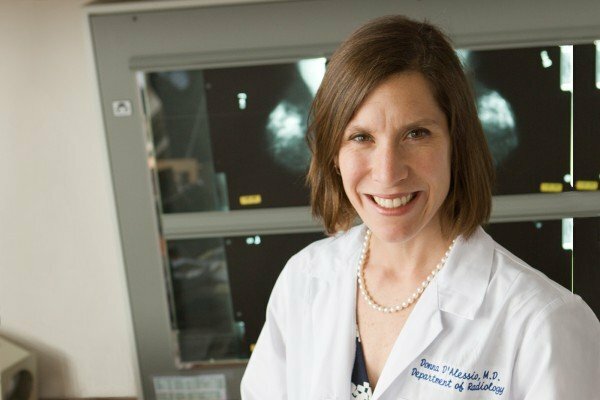 I am a member of the Breast Disease Management Team (DMT) and focus on the detection and management of breast cancer using imaging techniques including mammography, ultrasound, and breast MRI. I am also certified in interpretation of digital breast tomosynthesis. I care for patients who are routinely screened for breast cancer, who are at high risk for developing breast cancer, or who may have symptoms related to the breast. I specialize in minimally invasive image-guided breast procedures including stereotactic breast biopsies with x-ray guidance, ultrasound- and MRI-guided breast biopsies, and pre-operative image-guided radioactive seed and wire localizations. I work with other members of the breast DMT in collaborative research related to breast imaging, breast disease, and breast cancer treatment and management. As a body imager, I am primarily involved in interpreting CT scans. My work in cross-sectional body imaging focuses primarily on the interpretation of CT scans and radiographs. I collaborate with medical and surgical oncologists to provide quality evaluation of CT scans that are performed as part of patient treatment management and to assess for acute illness. In addition, I serve as a radiology consultant on clinical trials aimed at developing new treatments for cancer. As a clinician educator, I am involved in multiple aspects of education within Memorial Sloan Kettering Cancer Center and the New York community. At Memorial Sloan Kettering, I am involved in hands-on teaching of residents and fellows training in breast imaging and body imaging (CT). Administratively, my role as the Coordinator for Communication Skills Education involves establishing programs developed to enhance the communication skills of our specialty trainees. As the Breast Imaging Technologist Coordinator and Liaison, I organize instructional programs for continuing education of the technologists. My administrative duties within the hospital also include serving as a member of the Radiology MRI Safety Committee. As a member of the greater community of radiologists, I have served as treasurer, vice president and president of the New York Breast Imaging Society, which is a source of continuing medical education for practicing breast imaging radiologists in the New York metropolitan area. I serve as a delegate to the New York State Radiological Society. I also enjoy working with educational outreach programs designed to bring information about breast cancer and breast cancer screening to the community.